It’s 10am in Starbucks on George St and the annual ‘Fringe’ Festival, the edgy anarchic precursor to the Edinburgh Festival, the largest performing arts event of its type in the world, is in full swing. The crowded streets are full of students, tourists, street performers and comedians hurrying to perform at their next show. Overcast skies and a light but persistent rain accentuate the grey granite of the Georgian terraces. Mellon, tall and slim, crackling with energy and ideas, arrives on time, just showered after his morning run. He is training for the New York Marathon, which will be his 23rd marathon. His BlackBerry beeps every couple of minutes with a succession of stock and currency prices, emails and texts. Mellon executes four or five currency trades during the interview. Q: Why Edinburgh, and why the Fringe Festival? A: My father is from Glasgow but my mother is from Edinburgh and I was born here, and have always felt an affinity with the city. I’ve been coming to the Fringe for about fifteen years. I like the energy and enjoy good stand-up comedians. Q: Are you related to the Pittsburgh Mellon banking dynasty? A: A distant cousin. At the time of the potato famine in Ireland, I think around 1830, the Mellons left Ireland — they went to America and we came to Scotland. I used to correspond with the late Paul Mellon. Q: Your father is the retired diplomat, Sir James Mellon, who was Ambassador to Denmark, High Commissioner in Ghana and Consul General in New York. Do you think the constant moving explains your lifestyle now? A: Probably. I like to stay on the move and never spend more than a couple of weeks in one place. Q: Where is home, then? A: I have houses scattered around — St Anton, Brussels, Edinburgh — but Ibiza and the Isle of Man have to be home. Q: You went to Ampleforth and Oriel College, Oxford, where you recently donated a new hall of residence. A: Ampleforth was cold, sport-obsessed, and I just worked hard to get into Oxford. Oriel College was liberating and stimulating. At the opening of the new hall of residence I was sat next to the Queen, who is the ‘Visitor’ of Oriel. She was friendly, a master of small talk, and deft at avoiding any subject that could be controversial. Q: After Oxford, in 1979, you went to work for Griffin Thornton (GT). A: I got six job offers but accepted GT because it was the only one overseas. I did six months in Hong Kong and then went to San Francisco, where I was soon managing the assets of their US clients. I was lucky in that it was the start of the great bull market 1980–2000. A: I had the opportunity to travel with him as he scoured the world for opportunities. He thought globally and was flexible and capable of changing his mind. He used to say, ‘Foolish consistency is the hobgoblin of the small mind’ [a misquotation of Emerson]. We bought into the San Miguel brewery in the Philippines, which was one of the best stocks of the 1980s. Thornton was a mercurial but difficult character, who was ultimately let down by his temper. Q: In 1984, you left GT with Richard Thornton to raise funds to manage in Asia, and spent the next four years working in Hong Kong until the business was sold. With the proceeds, what was the first thing you bought, and do you still have it? A: My original stake of £25,000 made me a couple of million and I bought my house in Ibiza for £250,000. It was a simple house in the hills, but now I have a few houses around it and 800 acres. Q: It was at this stage you moved to the Isle of Man, where you are now the major property owner and the main employer on the island. Why the Isle of Man? A: It’s a good base to establish new businesses from a tax and regulatory point of view, and I have become friends with the administration over the years. Q: After a break you set up Regent Pacific — of which you still own 20 per cent — to invest in emerging markets with the late Sir John Templeton as your first client. A: In 1992, with Jayne Sutcliffe [who now runs the Regent spin-off, Charlemagne Capital], we set up Regent to specialise in breaking up closed-end funds in Asia which were selling at a discount. John Templeton also thought it was a good opportunity and gave us $20 million to get started. Having bought a stake in the fund, we then used a variety of techniques to narrow the discount, such as liquidating the fund, a special dividend, buying back shares and shortening the length of the fund. We did fourteen successfully from 1992 to 1994. Q: In 1994, you were passing through Moscow at the beginning of the privatisation process and you found Russians selling vouchers on the streets that were good for stock in Russian industries. Sensing an opportunity, you instructed your Hong Kong office to send $2 million. A: The $2 million arrived in a suitcase with DHL and we spent it in the covered markets in a day. We then changed the vouchers into stock certificates in a brokers’ office. Q: Six weeks later Jayne faxed you in Ibiza to say the Russian shares were worth $17 million and asked what to do. What did you say? A: Sell, of course, and let’s set up a fund manager in Russia. We set up businesses managing funds in Russia and in Asia and then had a bit of luck in that our partner in the Asian business, Altamira, had to sell its 50 per cent back to the directors if it got taken over, and lend us the money to buy it. In less than a year they had an approach, and within a week of buying their 50 per cent stake we sold it for double. We then had to go public (for $250 million) in 1997 to provide liquidity for the new shareholders. A: In hindsight I was overly vociferous, and I have not done it again like that — I’m now more behind the scenes and try and work with the management. However, I am a champion of shareholder rights and I didn’t think Hambros’ ownership of Countrywide and lifestyle investments in cigar sellers and restaurants made sense for a bank. I also felt the Keswicks appeared to be running it as their personal fiefdom — one at Jardines, one at Hambros — and not in the interests of the shareholders. Q: In 1998 you survived two major problems with Russia, which defaulted on its bonds, and Korea, where you had a fight with the government, which you have used to illustrate the dangers of emerging markets. A: Our Russian team misjudged the situation, as did Soros and the Tiger Fund, and, allied with the devaluation of the rouble, we lost $50 million overnight. In Korea, our local partners turned out to be crooks and were, unbeknown to us, illegally trading in the shares of the brokerage house we had bought into. As chairman of the overseas investors, I was accused of being complicit in market manipulation, but charges were never brought against me. It’s par for the course in emerging markets. I have also been sued for defamation in Bangladesh; and in Russia, when we raised $200 million to buy Gazprom stock reserved for local investors, I was told I was heading for the bottom of the Moscow river. A: I backed off. We had too much at stake in Russia and I know when to walk away. Q: In the past you have said that ‘the responsibility of a company is exclusively and absolutely to the shareholders — it does not have responsibility to its employers, management or customers other than to further the interest of the owners’. Now you employ two to three thousand people, do you stand by this remark? A: Absolutely. I try to create streams of income and build good companies for shareholders. I also try to make my employees shareholders when possible. A side benefit of a good company is that it creates employment, but the company is for the shareholders. 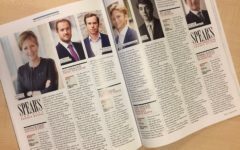 Q: Despite making your fortune in emerging markets such as Russia and Eastern Europe — where you still own 20 per cent of Charlemagne Capital, the emerging-markets fund manager listed in April 2006 that specialises in Eastern Europe — you have invested your own capital mainly in property in Western Europe. In Berlin, where you invest personally and through the listed manager Speymill in which you have a 44 per cent stake, you now own 48,000 apartments. Why Berlin? A: They are actually all over Germany; around 25 per cent are in Berlin. Germany is the only property market where the price of property is below its replacement cost. The strong rental culture is changing, with more people starting to buy. People want yield and ‘buy to let’ is starting with mortgages becoming easier to get. There is a healthy margin between the yield and the cost of borrowing. Q: You are also investing in commodities through Regent, which is now a mining investment company listed in Hong Kong, with your partner Steve Dattels, former finance director of Barrick Gold. Your start-up UraMin was sold in 2005 to Areva for $2.5 billion and now you are doing the same with Emerging Metals Ltd, which has a stake, via Kalahari Minerals, in the Extract Resources uranium deposit at Rossing South, which looks as if it could be the largest deposit ever found. A: Steve and I started UraMin in September 2005 with $100,000 split 50:50 over a drink at my pub in Notting Hill Gate. We sold it for $2.5 billion in September 2007 and shared $130 million. I took him out to celebrate at the Eiffel Tower restaurant. We are now doing similar with Emerging Metals Ltd (listed on London’s AIM market) with a stake in the Rossing South uranium deposit in Namibia, which is even bigger. Q: You are backing solar power and have been quoted as saying, ‘Solar is genuinely clean, it ticks all sorts of zeitgeist boxes. Within five years, solar power will be as cheap as oil and gas without the subsidy… it will be bigger than the internet in five years.’ Emerging Metals Ltd was set up as a vehicle to invest in materials that are used in solar panels, but its only major investment so far has been the (admittedly spectacularly successful) stake in the Rossing South uranium mine. Is this because you are losing faith in the solar future? A: No, I am just as keen on solar power. The potential of the Rossing South mine is staggering and we seized the opportunity to invest in it. When Emerging Metals realises its stake one way or another we will refocus on solar investments. Q: In 2005 you wrote the book Wake Up! Survive and Prosper in the Coming Economic Turmoil, which foretold the current economic downturn two years before it happened. At the time you were labelled the ‘Alphabet of global downturn’ in The Observer, but you turned out to be right. However, the Sunday Times Rich List has recently marked you down by £200 million. Is that because you didn’t follow your own advice and go liquid? The Sunday Times is about right. We have weathered the storm but it was impossible to liquidate everything, and a variety of shareholdings have decreased in value. However, we did deleverage, entered the downturn with plenty of cash, and Berlin was the only property market to rise in 2008 [up 8 per cent]. Q: Your latest book, The Top Ten Investments to Beat the Crunch: Invest Your Way to Success (Capstone Press), explains what you believe will be the best investments for the medium term. For those Spear’s readers who haven’t read the book, what are they? A: It’s too complicated to explain in a paragraph. If interested, they can buy the book (click here to buy this from the Spear’s/Amazon store). We also have a free newsletter which Spear’s readers can subscribe to by registering on the website. A: An investor — trading is a hobby. Q: How long is this recession going to last? A: Three more years in the West, one year in the East. I don’t see green shoots, just a bear-market rally. Q: In a speech at the 2009 Master Investor Conference, you described the Labour government as ‘a bunch of Muppets’, and you are now a leading financial backer of David Cameron. Although you studied politics at Oxford, it is only recently you have become involved in British politics? A: I am distressed to see what Labour are doing to this country: suffocating entrepreneurship, a crazy crackdown on the non-domiciles who bring so much money and expertise into the country, a bloated public sector and imposing political correctness… it’s all so anti–British! Q: Although you still run every day, and have completed 22 marathons, some people say you are mellowing and spend more time in Ibiza writing songs and playing the guitar. A: Mellowing? Who said that? Yes, I write songs and play the guitar, but mellowing, I don’t think so. Do you want to come and run the New York Marathon with me on 1 November? Q: You preach frugality and live modestly. There’s no yacht or fast cars — but the private jet seems a contradiction. A: Frugality is a Scottish virtue [laughing in a Scottish accent]. The plane is a business tool. My travelling pattern is unusual with Berlin, the Isle of Man, Ibiza, all of which are poorly served by commercial air traffic. Q: You have never married. Is there any hope for the right girl, or are you a lost cause? A: I am not anti-marriage. I guess my nomadic lifestyle didn’t help. I hope to meet the right girl, but it just hasn’t happened. Q: Best decision and best result? A: Best decisions were starting my own business and buying my house in Ibiza. Best payday was when Charlemagne Capital went public a few years ago and I was paid £55 million in cash. Q: You have said you are going to give your fortune away and that your beloved dogs will never go short. Should the Jack Russell Terrier Club start courting you, or will it be a foundation along the Gates/Buffett model? A: Yes, I am going to give it away and I have started to work out the beneficiaries. It will include dog charities, but also charities for the elderly and for research into diseases.